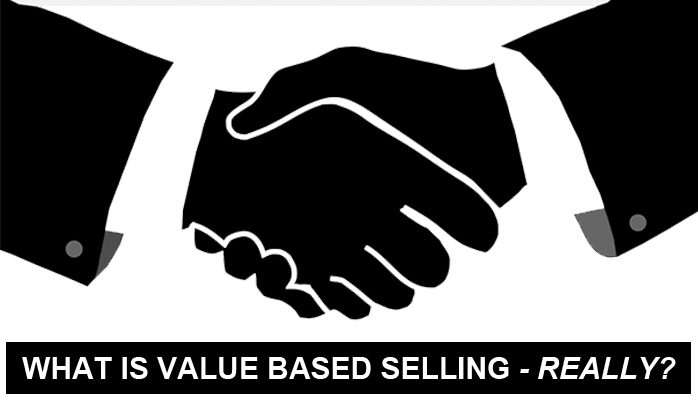 Value Byte / What is Value-based Selling – Really? What’s in a name? Take “Value-based Selling (VBS)”. It’s a great concept, that’s morphing into meaningless. Let’s get VBS terminology back on solid ground. In a nutshell (to paraphrase composer Duke Ellington) “VBS Don’t Mean A Thing (If It Ain’t Got that Swing)”. Gains executive respect and trust via targeted, client-relevant conversations, conducted early and often. Demonstrates strong knowledge of the client’s industry, firm and problem. Clarifies the value of the client’s problem before discussing the value of our solution. Tailors the Value Proposition to the needs of a specific client (generics are a no-no). Articulates soft (intangible) benefits as strongly as hard ones. Aligns client’s enterprise goals to our solution features and benefits. Emphasizes storytelling by framing value in narratives our client can emotionally connect with. Provides pragmatic value realization support to assure our solution actually makes the client “value successful”. Arms the sales rep as well as value specialists with all the capabilities listed above. Value-based Selling is ultimately about the customer or prospect, not about the seller. So this is how we believe selling must have a nine-beat swing to become truly value-based. Anything less, we fear, makes Value-based Selling into wishful thinking. Do you concur? Comment below or email me at Jack.Keen@VSRCouncil.org. To interact personally with over 100 value leaders and practitioner, attend the world’s first Value Selling & Realization Summit in Dallas Feb 29 – March 1, produced by the Council. P.S. There’s a new, no cost source to tap into for the latest thinking, methods and activities of Value-based Selling, and realization. Join the non-profit “Value Selling & Realization Council (www.vsrcouncil.org), as well as the LinkedIn Value Selling & Realization Group (https://www.linkedin.com/groups/8433501). ABOUT THE AUTHOR: Jack Keen is a globally recognized value selling and realization management consultant, trainer, methods designer, and thought leader. His 25+ years experience on five continents as CxO advisor to major providers and buyers alike, and his value realization/change management team leadership on major IT-enabled implementations, has brought him nine industry awards. As a thought leader, he has authored the top selling book “Making Technology Investments Profitable: ROI Road Map from Business Case to Value Realization” (John Wiley & Sons, Inc. 2nd edition, 2011), major media articles, and blogs, as well as conducted speaking engagements and workshop facilitations at top venues. He serves as Vice-President for Value Strategy for the VSR Council.